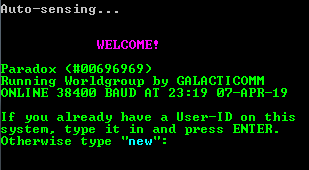 The KEEP BBS has been online and operational since 1983, now we are a 32-channel MULTI-USER Worldgroup 3.13 system. The KEEP is still here. And we will endeavor to remain here for you, regardless of what new trends the Internet may follow. Wildcat! 4 board running on a IBM PS/2 Model 70, 30MB of roaring HDD space for all your file transfer needs! Set up as a hobby system and decided to run it 24/7 in this capacity.